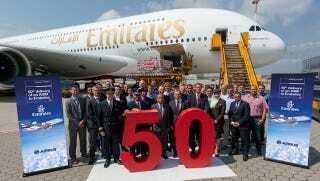 Airbus and Emirates Airlines celebrated a major milestone today, delivering Emirates' 50th Airbus A380 to the airline. Along with the plane, 41 tonnes of humanitarian relief supplies were sent to a UN depot in Dubai. Following delivery of their first A380 in July 2008, Emirates took delivery of their 25th A380 in October 2012. All Emirates' A380s are powered by Engine Alliance GP7200 engines. The airline has 140 A380 on order, while U.S. have ordered none. In addition to having the largest A380 fleet in the world, Emirates also flies more Boeing 777s than anyone else. Airbus says the total A380 fleet has accumulated over 1.4 million flight hours in more than 172,000 commercial flights. To date, over 60 million passengers have flown on one of the 136 A380s in service. Every four minutes, an A380 either takes off or lands at one of the 37 airports where it operates today and the network continues to go.